Kurt of Gerolstein: A Dynamite Surprise ....! Today, five days after Mister B’s first appearance at any workout, he stepped out again. He needed to capitalise on what, hopefully, he had learned in his first ‘race’ and, of course, over the holiday period, things like trials and workouts are rarer than my teeth. 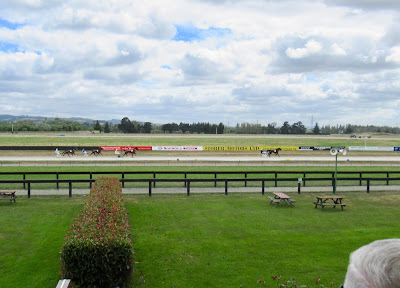 And as the events today were at our local racecourse in Rangiora, what more obvious then that we bundled into the little red car and that way went. 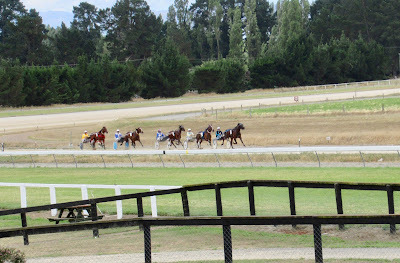 Now, as I said last time, our boy clearly has speed, but he also has a lot to learn about Being a Racehorse. So what was our surprise to see that he was in the field for Heat Two. The standing start qualifying trial! Already? We thought that was weeks or months away. Well, he was there a little under false pretences. 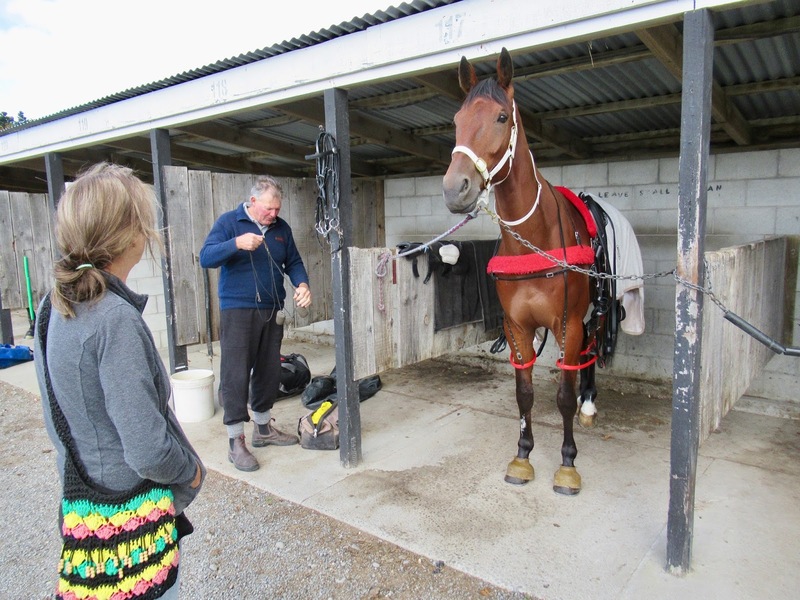 He was coming from Bank’s Peninsula with a sweet little mare called Naturally Good, whom Murray is preparing for the holiday meeting at dear old Richmond Park (both Wendy and I hail from little Richmond). Her race was at 1.30. The learners’ heat was at 3.00. Well, Mr B was only in for more practice, so Murray popped him in the qualifying heat at 11.15 instead. Saving an hour and a half of a working day. He could just go around at the back of the field and practice doing things right. Well, he sort of did. This time he didn’t rear up. He lined up sagely in his outside spot, and when the tape went ‘ping’ he didn’t throw a catatonic. The new earplugs probably helped. So he didn’t gallop away. 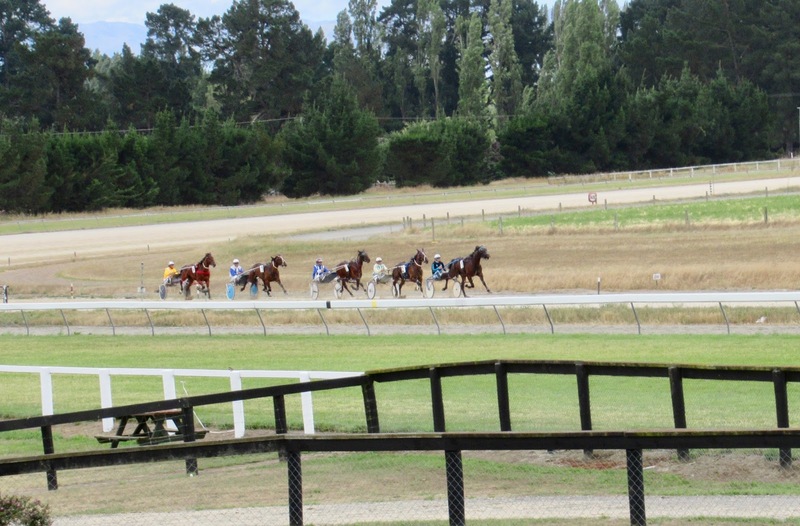 He walked gently out and gradually raised his game for a furlong or so ... Safe! I began dreaming that he might even qualify. You can only qualify if you run the time, and if you don’t gallop. As they came round the final bend, Mr B had moved past the tiring filly in fourth, and then Murray pulled the ear-plugs … The leader, an impressive black three year-old, Flying Mister Ideal, by American Ideal out of Flying Mrs Williams, was already off and gone towards the line, but good old Mr B swooped strongly, as he had the previous week, and zoomed enthusiastically past everyone else … We looked at one another in surprise and delight. Whee! Second time on a race track and … I mean, whee! And surely … he must have qualified. 3.31.8 was the fatidic time. Yes. 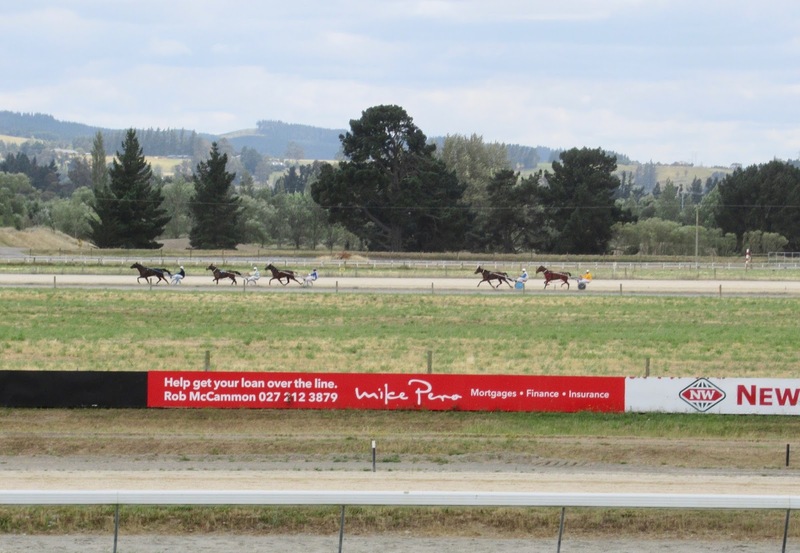 The run-away winner had cut out the 2600 metres in 3.22.4. Real race-winning time. Mr B, even with his careful start, which had cost him 8 to 10 lengths, had run 3.24.6. PS The Learners Heat was run in 3.43.0. Another world … circumstances were surely on our side! Thank you, little Miss Naturally Good.